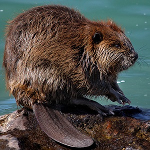 The object of the game is to gain as many pelts as possible, knowing the Beaver pelt is worth the most. You can play in teams or individually. Roll the dice and move forward that number of tiles on the board. If you land on a Wigwam tile, draw a card and identify the animal on the card to gain a pelt. If you land on a Drum tile, draw a card and perform the action on the card. If you land on an Animal tile, identify that animal to gain a pelt. At the end of the game, count your animal pelts and convert them to tradable Beaver pelts to trade at the Trading Post.